A woman was driving her old beat up car on the highway with her 7 yr. old son, Little Johnny. She tried to keep up with traffic but they were flying by her. 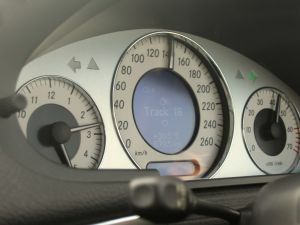 After getting caught in a large group of cars flying down the road she looked at her speedometer to see she was doing 15 miles over the speed limit. Slowing down, she moved over to the side and got out of the clump that soon left her behind. She looked up and saw the flashing lights of a police car. Pulling over she waited for the officer to come up to her car. As he did he said, "Ma'am do you know why I pulled you over?" Little Johnny piped up from the back seat, "I do! Because you couldn't catch the other cars!"